Jonathan Williams (L) defends against Isaiah Briscoe (R). Old friends Jonathan Williams and Isaiah Briscoe were reunited on the basketball court. This this time, however, it was as rivals rather than teammates at the 6th Annual Newark National Invitational on January 31. 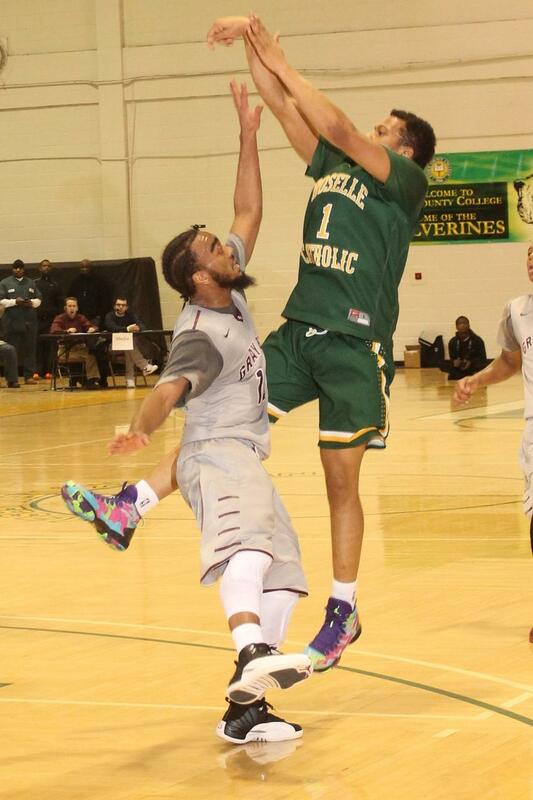 The Gray Bees triumphed, 64-58, over the Roselle Catholic Lions after a hard-fought fourth quarter. Briscoe, who played for SBP last year before transferring last summer, scored 22 points to earn team MVP honors for Roselle Catholic and Williams, MVP for St. Benedict’s, scored 10 points. The gym at Essex County College, instead of Prudential Center this year, was mobbed for the last game of this year’s Newark National Invitational tournament. The Gray Bees missed 17 free throws during the game, including 9 in the fourth quarter. However, the team closed the game with Williams sinking the last two free throws with 14.2 seconds on the clock. “Our free throws could have been better,” St. Benedict’s coach Mark Taylor said. Briscoe (in green) defends as Jon Williams drives down the court. The Gray Bees were led in the scoring department by Kamar McKnight, who led the team with 13 points, while Trevon Duvall followed with 12. Fans cheered whenever Williams and Briscoe went head-to-head. And Williams relished the opportunity to go up against his old comrade. “It feels great, playing against a friend,” Williams said.